can i just tell you how excited i am to be doing some collaboration with amberly from a prioritized marriage?! she is a phenomenal marriage blogger and always delivers excellent and thought-provoking content. i’m over on her blog today sharing my ways on how to maintain your sense of self in a relationship, so come say hi and check out some brand spanking new photos i just had taken (one of them sort of looks like i’m a biker-chick)! I’m really excited to be teaming up with Chelsea for this post today!! I’m Amberly and I blog over at A Prioritized Marriage. I’m a Family Studies major who has a passion for encouraging people to make their marriage a priority throughout every stage of life and I’m excited to be sharing some my excitement in this post today! Be sure to stop by my blog after you’re done reading this post and read Chelsea’s thoughts on the subject because they’re awesome! It’s no secret that I’m a big fan of marriage and working together as a team. My relationship with my husband is my top priority and I always put it first in my day to day activities. As much as I value our marriage and the life that we’ve created, it has always been important for me to maintain my sense of self and make sure that my individuality doesn’t get lost in a sea of we and us. After I got married, I had a lot of people assume that I didn’t want to hang out with them anymore because I would want to spend every waking moment with my spouse. I’ve also seen other wives turn down a girl’s night or some other activity because they can’t stand to be away from their husband for a night. I can appreciate the need for quality time together because that is my love language, and with the busy schedules that Joe and I have, I take advantage of any time that we are home together, but I feel like it is important to spend time away from each other as well. There have been quite a few nights when I’ve gone off and done something with friends or on my own and Joe has done the same. Both of us usually have an hour or two on our own while the other is at work or school every day, but we still appreciate those nights when the other feels free to do their own thing even if we are home without them. We also try to spend time apart when we are home together. There are a lot of nights when he’ll be out working in the yard or upstairs watching his own TV show and I’ll be downstairs taking a bath, enjoying my own TV show or working on a project of my own. By not feeling like I need to be by Joe’s side every single moment that we can possibly be together, I’m still able to do my own things, enjoy time with myself and do something fun with friends. If you’ve seen Runaway Bride, you’ll understand where I’m going with this point. In the movie, Julia Roberts’ character is ridiculed by a writer for her inability to commit, and later for the fact that she doesn’t have her own likes and dislikes. The example that they focus on is that she has no idea how she really likes to eat her eggs. With every man she’s dated and almost married, she coincidentally loves her eggs cooked the same way that they do. In the end, she sits down and samples eggs cooked every way possible and finds the one that is her preference. From there she is able to figure out who she is as an individual and follow through with a marriage. There are a lot of things I like that I would never have thought to try if I weren’t married to Joe, and a lot of opinions that I have because he has opened my eyes to new things and different perspectives. Even though we have our likes/dislikes and opinions as a couple, I have still maintained my own and I don’t let his opinion of those things change mine. Joe hates onions, even cooked in things, but they are my favorite so I still add them to my recipes, I just don’t add as much as is called for so that he doesn’t have to deal with as many. And when we order our favorite Barbecue Chicken Pizza, we order half with red onions and half without. It’s the same way with quite a few other things. We each have our own things that we love and we compromise where necessary, but don’t let the other person’s opinion change ours. Another thing that I’m always sad to see couples do is lose contact or stop doing things with the friends they have who don’t become “couple friends.” Joe and I have friends who we do things with a lot as a couple, and we even have some friends who aren’t in relationships right now, who we both consider a friend and we’ll hang out with them together. But I also have friends who we just don’t mesh with as a couple, or who I only get together with on my own. Rather than getting rid of those friendships that aren’t part of my marriage relationship or just letting them fall through the cracks, I keep them up! Those times that I am apart from Joe, I spend with some of those friends. I talk to them on social media, call them on the phone or text them frequently. We stay caught up on each other’s lives and make it a priority to get together often. These are people who I’ve known for years and really enjoy spending time with, I would hate to lose them just because Joe isn’t interested in a friendship with them too! I love my husband and I love our time together. He’s the one person that I love to be around and don’t think I could ever get tired of spending time with. But I also love who I am, and Joe married me for who I am as an individual as much as he married me for who we are as a couple and the type of person that we both are when we are together. I know that if I didn’t maintain my individuality, we would get bored with each other and life wouldn’t be as exciting or vibrant when we are together. Staying true to who I am, taking time for myself and always making sure that I maintain my individuality makes me better as a person and our marriage relationship better as well! 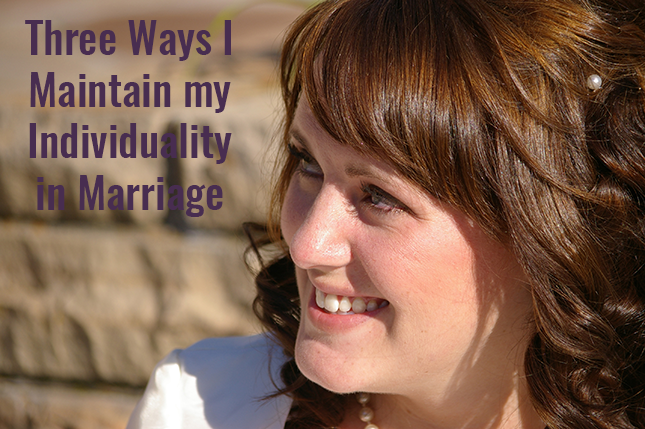 How do you maintain your individuality in marriage? don’t forget to head over to a prioritized marriage to check out my blog post on how i maintain my sense of self in marriage! My husband and I actually spend a lot of time apart because of his travel schedule, so being independent isn’t our biggest challenge. But I so agree that maintaining your own identity is important. We can encourage one another to be the person God created us to be. I so agree about maintaining relationships with people who aren’t married! that would be tough to spend time apart, especially if it’s not your choosing, seana! glad you agree that having your own identity is important and friends who aren’t married are still important to have in our lives! thanks for your thoughts!